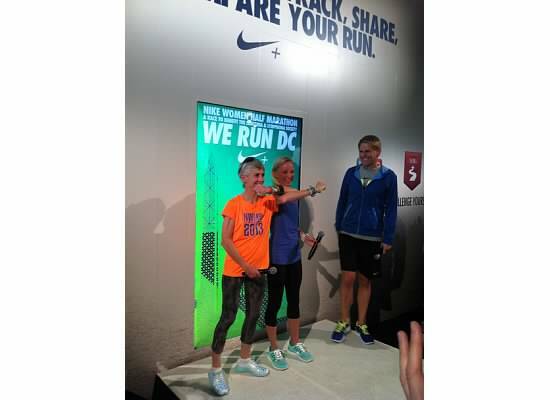 “I am incredibly proud to be a part of the first Nike Women Half Marathon in Washington, D.C.,” said Benoit Samuelson, who joined runners in a moment of silence prior to the start of the race to honor the victims of the Boston tragedy. “Now more than ever, it’s important that we continue to unite as a running community. We all run for different reasons, but today we are 15,000 strong, running with all our hearts to celebrate women and to support the Leukemia & Lymphoma Society.” via Nike, Inc. Thanks Nike, Joanie & Shalane! Thanks for the link! Were you guys wearing matching shirts? I believe I saw you guys, it looks like we finished around the same time. It was a great race, I'm glad you enjoyed it as well! Thanks for the link! Looking forward to your recap! Thank you for the link!! Looking forward to your recap of the event! Great job Malinda and thank you for the link up! Can't wait to read your recap!